With all our visitors gone we had wash day. Did you know how much fun wash day is????? Granny had pegged the washing out and went inside, I had so much fun. Did you know it was like having a playground in your own back yard. I felt safe in this swing. I don't think I will fall out. Granny and I received a parcel all the way from Russia. Mary made me this cute little bird and post cards from the city where she lives. Plus a beautiful Christmas card that she must have spent hours making. We watches the firework on the Television. They were over Sydney Harbor. I thought smoke would come out of the screen there was so much smoke and pretty lights. We had extra honey and peanut on toast for supper because it was New Year. Then we went to bed thankful that we have warm beds and a roof over our head, food in our tummy's and wonderful friends. but scattered in precious, glittering particles, through the common rock of daily living. It is only when we gather these shining particles together that we realize how rich we are in joy." Happy New Year. Wow, look at all the fun you had on wash day. I bet you were tired after all that fresh air and inventing new play things with the laundry. That sounds like the best way to spend a new year! Well, perhaps unless you had to do the actually washing. LT's been grumping her way through a few piles too, but we have no garden or washing line, so it goes in the driver or on the pulley in the hall, and they're not so much fun to play on! Happy New Year to you, dear Wilbur - and of course to Granny, too! Looks like 2014 already started happy for you... with having so much fun with and in the laundry... ;O) Your saying was especially lovely today, this was on shining particle we found today! Thank you, Wilbur! I hope you and Kay had a great start into year 2014, too! Wow, what a wonderful present you got from Russia - parcels are always so much fun! That wash day could be fun, too, was new to me. Thank you for your cute photos and wonderful story! You know Wilbur ... I think you done the very same thing on New Years Eve as I done. watched the fire-works on telly then dropped off to sleep ... oh! But I didn't have the nice runny honey and peanuts like you. tell Granny her thought for the week was very special. oh how sweet indeed!!!! I wish there was some warmth with the sun here!!! but we are experiencing super chilly weather here....with the windchill it is - 39 degrees C!!!! The firesworks looked amazing over the Sydney Harbour bridge - we saw them on our TV too. Happy New Year to you both and sorry I took so long to come over. This was such a "sweet" post. The honey helped a lot I think. Happy New Year, Wilbur! Abby has been pouting because she didn't get a Barbie motorcycle. Shhhhh...don't tell her I mentioned it. I am just not into those for little bears. Ok? I love the way the post ended too. Brought tears to my eyes. This Granny has been sort of emotional lately. Hugs to both you and Granny.. Happy New Year Wilbur & Granny!!!! I hope you will have a wonderful 2014!!!! I love your beautiful "washing swing". Must be great to sit in or hang in. We hat lotsa smoke on New Years Eve too. I'm glad it's over. Send my love to Granny for me will ya! 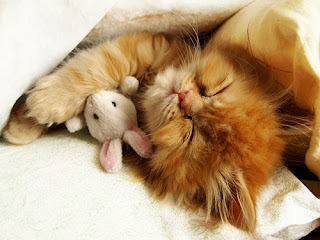 What a sweet post and I love the kitty photo with her little rabbit. Is she yours? Wishing you all the best for 2014! In good health.